"Masquerade Ball is the most elegant classy event ever to be hosted in Pretoria for the first time, this event is targeted at young adults of Tshwane it is a red carpet event. Masquerade ball is an event that's going too filled with dancing, excitement but yet formality in it, the event will have best performances from all around Gauteng I'm talking about your best dance crews, best singers, rappers and poets, live bands and comedians. * Massive giveaways and an atmosphere filled with Love and Intimate Dancing all night. 012 Back at it again!!!!! 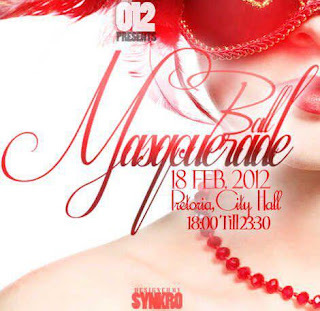 Masquerade Ball the event to be at, hihihi you can come in pairs or singles we going to have fun at the end of day!!!! !